The Michigan World War II Legacy Memorial, an upcoming tribute to showcase the state’s contribution during the global conflict, will be built in Royal Oak and will focus on contributions made on both the warfront and the home front. 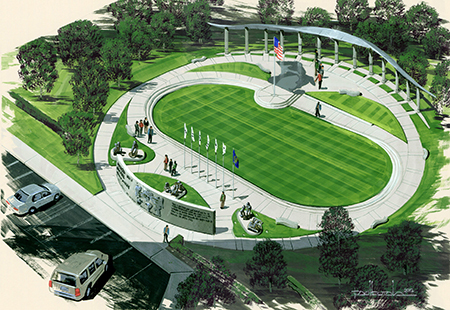 The memorial will be built on donated land in Memorial Park at the northeast corner of 13 Mile Road and Woodward Avenue — which was dedicated to be a World War II memorial in 1948, but was never pursued and carried out. The oval fashioned structure will include a central grassy area that can be used for picnics and concerts in the warmer months. It will become an ice rink during the winter. “We wanted this to be a place that people will go to and honor the veterans and respect the freedoms because of them. (Additionally), we want it to be a celebratory, interactive place,” Hollis says. Features of the memorial include a granite walkway through a Michigan map, highlighting the areas where the state made contributions to the warfront; 13 pillars representing aspects of war, such as service and industry; and three statues, representing land, sea, and air military branches. After the group’s $3 million dollar fundraising goal is met, Hollis estimates the memorial will take six months to complete. She says most engineering jobs have been completed and paid for, including soil tests, civil engineering, and structural engineering. In addition to support from the city of Royal Oak, the mayor, and city council, the Michigan Legislature recognized the memorial as a state tribute.